Here is the list of the hotels near Vouneuil-sous-Biard. Book your hotel near Vouneuil-sous-Biard today, Thursday 09 May for the best price, reservation and cancellation free of charge thanks to our partner Booking.com, leader in on-line hotels reservation. Below here is the list the 50 closest hotels of Vouneuil-sous-Biard, sortable according your criteria. You will find the position of these accommodations on the Vouneuil-sous-Biard hotels map. This hotel is 6 km from the centre of Poitiers and a 20-minute drive from Futoroscope Attraction Park. It offers a meeting room, free WiFi access and free private parking is available on site. All the heated rooms at Kyriad Poitiers Sud offer a flat-screen TV, an electric kettle and a private bathroom with free toiletries, a shower and a hairdryer. From Monday to Thursday, the hotel’s restaurant is open in the evenings and offers traditional French cuisine. Guests can dine on the terrace during the summer. Kyriad Poitiers Sud is a 12-minute drive from Poitiers Cathedral and 3 km from the A10 Motorway. The nearest airport is Poitiers-Biard Airport, 3.3 km away. This Campanile hotel is located in a quiet area 5 km south of Poitiers and just 1 km from the A10 motorway. It offers free Wi-Fi access and free parking. The guest rooms include a private bathroom, tea and coffee making facilities and TV with TNT channels. Campanile Poitiers serves a daily buffet breakfast. The hotel restaurant is open for lunch and dinner serving a variety of traditional French dishes. The Campanile Poitiers is 4 km from the Poitiers-Biard Airport and 10 minutes from the TGV train station. The Futuroscope theme park is a 15-minute drive away. Apartment Poitiers Preferred hotel ! Poitiers is situated in the apartment, 4 km from Infantry Regiment, 5 km from Poitiers Town Hall, and 6 km from Rocade Distribution. The property is 6 km from I.A.E the accommodation. The apartment features 2 separate bedrooms and includes a kitchen with an oven, fridge and dining area. The accommodation also includes 2 bathrooms with a shower and a washing machine. Poitiers University is 6 km from the apartment, while Soregies is 7 km away. Poitiers-Biard Airport is 5 km from the property. Located a 5-minute drive from Poitiers city centre, and a 12-minute drive from Futuroscope Theme Park. The ibis Poitiers Sud is 4.6 km from the train station. It has a 24-hour reception, and provides free WiFi access in the soundproofed guest rooms. All the ibis Poitiers Sud rooms have a double bed, a desk, Internet access a TV with all the main channels as well as a private bathroom. A buffet breakfast composed of sweet and savoury dishes such as eggs, fruit salad, yogurts and juices is served every day. Pastries baked on site and fresh French Madeleine cakes are also on offer, as well as a hot beverage and a piece of fruit to take away. Outside of regular breakfast hours guests can also enjoy a lighter option, available from 04:00. There is a Courtepaille restaurant on site as well as a 24-hour bar serves snacks and light meals. Private parking is free on site and Poitiers-Biard Airport is just 5 km away. A 2-star hotel, ibis budget Poitiers Sud is located 15 km from Futuroscope Theme Park and 5 km from Poitiers centre. It offers air conditioned rooms with free WiFi access. ibis budget Poitiers Sud rooms also include a work desk and a flat-screen TV as well as a private bathroom with a shower and toilet. A buffet breakfast is available in the morning. Guests can also find a snack and beverage machine in the hotel common areas and a microwave. Poitiers Train Station and Airport are located just 5 km from this hotel. Free public parking is available on site. Situated in Poitiers, Appartements Les remparts d'Alienor offers accommodation with free WiFi and seating area. The apartments are located on the second floor and are accessible by stairs. All units are equipped with a microwave, toaster, a coffee machine, a fridge and kettle. There is also a kitchen equipped with a stovetop. Poitiers Town Hall is 800 metres from the property. The nearest airport is Poitiers Airport, 2 km from Appartements Les remparts d'Alienor. Set 100 metres from Poitiers Train Station and 3 km from Poitiers Airport, ibis budget Gare de Poitiers has 24 hours reception, free Wi-Fi and a guest area with vending machines. Rooms here will provide you with a flat-screen TV, a desk and air conditioning. Featuring a shower, private bathrooms also come with free toiletries. In the morning, a buffet breakfast is served, including a choice of breads, cereals, brioche, butter, jams, honey, fresh fruit salad, yoghurt, cheese, hot drinks and fruit juices. A restaurant can be found 600 metres away. Notre Dame la Grande Church is 1 km from ibis budget Gare de Poitiers and the Futuroscope theme park is 13 km away. Parking is available on site at an extra cost. Guest accommodation Poitiers Preferred hotel ! This Sejours & Affaires property is located opposite the SNCF Train Station in Poitiers city centre. It offers studios and apartments with free Wi-Fi internet access. Guests have free access to the fitness room. Accommodation at the Séjours & Affaires Poitiers Lamartine is serviced by a lift. Each studio has a private bathroom, a TV and a kitchenette equipped with a microwave. The Poitiers Lamartine resort is just 10 km south of the Futuroscope theme park. Private parking is available on site and there are several bus stops situated outside the residence. Near the city centre of Poitiers, a Romanesque town with a rich historical heritage, Hotel The Originals Poitiers Continental (ex Inter-Hotel) offers comfortable and modern accommodation. The hotel, just 8 kilometres from Futuroscope welcomes you to a pleasant and calm area. Guestrooms are bright and cosy, soundproofed and equipped with modern en suite facilities. WiFi internet access is available throughout the hotel and is free of charge. Hotel The Originals Poitiers Continental is in partnership with a nearby restaurant and you will find parking facilities for cars and coaches near the hotel. This entirely non-smoking hotel is open 24 hours a day. The hotel Regina is in front of Poitier TGV Station and a 20-minute drive from the Futuroscope. It offers soundproofed rooms with flat-screen satellite TV and private bathroom. The Regina serves daily continental breakfast in the dining room and is close to many restaurants. You are invited to relax at the bar, and enjoy a selection of varied drinks. All of the rooms are accessible by lift. They are equipped with a work desk and free Wi-Fi is provided. The bathrooms have either a bath or a shower. Poitiers is easily accessible via the A10 motorway. 70 metres from Infantry Regiment, Astral Hotel is located in Poitiers and provides rooms with free WiFi. Popular points of interest nearby include Poitiers Town Hall and Poitiers University. Guests can have a cocktail at the bar. At the hotel, rooms are fitted with a wardrobe. The private bathroom is fitted with a shower. All guest rooms in Astral Hotel are equipped with a TV and free toiletries. Around the clock assistance is available at the reception. I.A.E Poitiers is 1.1 km from the accommodation, while Rocade Distribution is 2.6 km from the property. Poitiers-Biard Airport is 2 km away. Pictav hotel is conveniently situated opposite Poitiers station and within easy reach of the centre of town. All the rooms at Pictav Hotel are equipped with satellite TV and ensuite facilities. Free Wi-Fi access is available. The hotel is a 20-minute drive from the Futuroscope theme park. Parking is located in an area nearby. Boasting garden views, Gite Jardin des Roses provides accommodation with a garden and a terrace, around 1.4 km from Infantry Regiment. Complimentary WiFi is available. The holiday home consists of 2 bedrooms, a kitchen with dining area, and 2 bathrooms. A flat-screen TV is offered. Languages spoken at the reception include English and French. Hiking can be enjoyed nearby. Poitiers Town Hall is 2 km from the holiday home. The nearest airport is Poitiers-Biard Airport, 3.4 km from Gite Jardin des Roses. 50's Authentique Gîte 1950, boasting barbecue facilities, is set in Poitiers, 3.5 km from I.A.E Poitiers and 3.6 km from SEFI. This holiday home features accommodation with a terrace and free WiFi. This holiday home is equipped with 3 bedrooms, a kitchen with a dishwasher and an oven, a flat-screen TV, a seating area and 1 bathroom. Guests can relax in the garden at the property. Infantry Regiment is 3.7 km from the holiday home. Poitiers-Biard Airport is 3.2 km away. This friendly, family-style hotel is ideally situated in the city of Poitiers, a few minutes from the city centre and only 12 kilometres from the Futuroscope Theme Park. Opposite Le Memphis are buses, taxis, and the TGV train station allowing easy access to the town, local sites and attractions, and surrounding region. Le Memphis features 9 cosy rooms furnished with comfortable beds, private bathrooms and Wi-Fi access. Hotel Poitiers Preferred hotel ! Located in the heart of Poitiers, Hotel de l'Europe is just a 15-minute drive from Futuroscope. The hotel has a courtyard, a garden and offers free Wi-Fi internet access. Each guest room at the Hôtel De L'europe is equipped with satellite TV and has an en suite bathroom with a hairdryer. Every morning a breakfast buffet is served with homemade jam, cakes, local products, organic teas, organic fruits and locally roasted coffee. Hotel de l'Europe is a 5-minute walk from the Palace of Justice, Poitiers Cathedral and the Notre-Dame la Grande Church. The train station is a 15-minute walk away. Private parking is available at an additional charge and should be reserved in advance. Located in the centre of Poitiers, ibis Styles Poitiers Centre offers a 24-hour reception, free WiFi access throughout and air-conditioned rooms. Futuroscope is 11 km away. All rooms are decorated in a modern style and feature a flat-screen TV, a desk and a telephone. The en suite bathrooms include a shower. A buffet breakfast is available each morning at ibis Styles Poitiers Centre. Guests can also find restaurants within walking distance. The Notre Dame de La Grande Church is just a 10-minute walk away and the train station is 700 metres from the hotel. Private parking is possible at an extra cost and no reservation is possible. Centre ville tout confort enjoys a location in Poitiers, just 1.7 km from Poitiers Town Hall and 1.8 km from Infantry Regiment. Free WiFi is available in this apartment, set 3.3 km from I.A.E Poitiers and 3.4 km from Poitiers University. The apartment is equipped with 1 bedroom, a flat-screen TV and a fully equipped kitchen that provides guests with a microwave and a toaster. The apartment also offers 1 bathroom. The apartment offers a barbecue. Guests can also relax on the sun terrace. Soregies is 3.9 km from Centre ville tout confort. Poitiers-Biard Airport is 3.8 km from the property. Le Grand Hotel is a designer hotel situated in central Poitiers, within walking distance of Notre-Dame la Grande and Poitiers Palace. It offers air-conditioned guest rooms with a contemporary décor. Each soundproofed room is equipped with a private bathroom, satellite channels on a flat-screen TV and free Wi-Fi. The hotel rooms are serviced by a lift. Best Western Poitiers Centre Le Grand Hôtel serves a buffet breakfast, which can be enjoyed in the comfort of your room, in the dining area or on the shaded terrace overlooking the garden. There are numerous restaurants and Poitier’s historic sites nearby the Grand Hotel. It’s less than a 15-minute walk to Gare de Poitiers. Located just 1 km from the train station in Poitiers, ibis Poitiers Centre offers air-conditioned rooms with free Wi-Fi access and St Pierre Cathedral is also 1 km away. It has a 24-hour reception. Decorated in a modern style, the guest rooms all have a flat-screen TV, a desk and telephone. Each room has a private bathroom that includes a hairdryer. A buffet breakfast composed of sweet and savoury dishes such as eggs, fruit salad, yogurts and juices is served every day. Pastries baked on site and fresh French Madeleine cakes are also on offer, as well as a hot beverage and a piece of fruit to take away. Outside of regular breakfast hours guests can also enjoy a lighter option, available from 04:00. There are traditional restaurants and pizzerias located just 50 metres from the hotel. The hotel is 15 km from Futuroscope Theme Park and you can visit the Notre-Dame la Grande Church, a 10-minute walk away. Located in the centre of Poitiers, La Maison de Marc offers a terrace and free Wi-Fi access. The train station is only 400 metres away and Futuroscope Theme Park is 10 km from the property. Decorated in an elegant style, all rooms feature a flat-screen TV, wardrobe, desk and wooden flooring. The en suite bathroom is complete with a bathrobe and hairdryer. A continental breakfast is provided each morning and it can be served on the terrace. Gastronomic and traditional restaurants are found within walking distance. The Notre-Dame Church is 300 metres away and the main shopping area is 50 metres from the property. Luggage storage is available at La Maison de Marc. Hotel Central is located in the centre of Poitiers, a 10-minute walk from Poitiers TGV high-speed train station. It offers en suite rooms with free Wi-Fi internet access. The guest rooms have a flat-screen TV with satellite channels and views of the inner courtyard or the Hotel de Ville. Some rooms also have a balcony. Hotel Central provides a daily continental breakfast which is served in the guest room. The hotel is just a 5-minute walk from the Notre-Dame-La-Grande and the Saint-Pierre Cathedral, as well as from the Hôtel de Ville parking. Futuroscope is a 15-minute drive from the hotel or 25-minutes away by bus. Aparthotel Adagio Access Poitiers is located in Poitiers, just 600 metres from the train station. It offers air-conditioned apartments and studios with a wired internet connection. A buffet breakfast is prepared every morning. Each apartment at Aparthotel Adagio Access Poitiers has satellite TV, a dining area and a fully-equipped kitchen with a microwave. All apartments are serviced by a lift. This property is easily accessible by the A10/E05 motorway and guests can visit the Jardin des Plantes, which is only 1 km away. Located 800 metres from Poitiers Train Station, this hotel offers air-conditioned rooms with private bathroom, a bar and a 24-hour front desk. Free Wi-Fi is provided and public parking is possible nearby. Each soundproofed room at Mercure Poitiers Centre includes a telephone, a radio and an electric kettle with tea and coffee making facilities. Rooms are serviced by a lift and some of them are suitable for disabled guests. Guests can enjoy a meal at the on-site restaurant named Les Archives. The breakfast is served every morning and can also be taken in the comfort of your room. You can have a drink at the bar while reading the newspapers, which are provided for free. The theatre is 350 metres away, Poitiers Palace of Justice is a 4-minute walk away and the Tourist Office is 450 metres from this Mercure hotel. 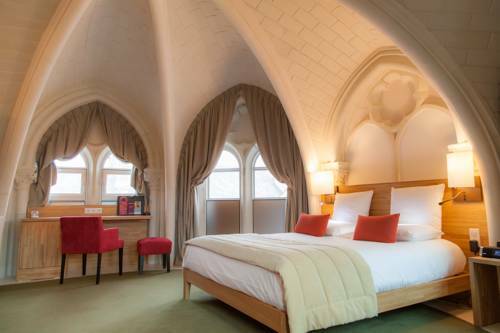 Poiters Cathedral is 900 metres away and the A10 Motorway access is a 15-minute drive away. Bien Etre Immo is located in the heart of Poitiers, and offers stylish apartments with balconies and free Wi-Fi access. It is just a 5-minute walk from the Notre-Dame-la-Grande Church. The apartments at the Bien Etre Immo feature parquet floors. Each is equipped with modern furniture and a kitchen with microwave and fridge. The apartments have modern bathrooms with showers and also have flat-screen TVs, some with DVD players. The property has a garden where guests can relax. The residence is just a few steps from the Palace of Justice of Poitiers. It is a 30-minute drive from Chatellerault and Niort is a 50-minute drive away (Autoroute A10/E05). Set 300 metres from Poitiers Town Hall and 400 metres from Infantry Regiment, Ed.Grimaux offers accommodation in Poitiers. The unit is 600 metres from Poitiers University. Free WiFi is offered . The kitchen is equipped with a microwave and a toaster, as well as a coffee machine and a kettle. Towels and bed linen are provided at Ed.Grimaux. There is a private bathroom with a bath or shower. I.A.E Poitiers is 600 metres from Ed.Grimaux, while Rocade Distribution is 2.3 km from the property. Located in a quiet district, in the city centre of Poitiers and listed as a Historic monument, this former private house offers a friendly atmosphere and warm welcome. Hotel Au Chapon Fin features spacious and bright rooms, and the entire establishment offers excellent soundproofing. Two of the rooms offer views of the city hall of Poitiers. There are also 2 rooms featuring a period fireplace and decorated in a classic style. A continental breakfast is prepared every morning at this hotel and is served in the dining room. Low-cost private parking is available on site. Situated in Poitiers, Les Appartements de Beaucé offers accommodation with seating area. Free WiFi is provided. Set on 2 levels, all units feature a satellite flat-screen TV, a private bathroom with bath and a fully equipped kitchen. A dishwasher and oven are also available, as well as a coffee machine and a kettle. Poitiers Town Hall is 50 metres from Les Appartements de Beaucé, while Infantry Regiment is 600 metres away. The nearest airport is Poitiers Airport, 2 km from the property. Situated in Poitiers, just 80 metres from Poitiers Town Hall, Apartment Grimaux.3 features accommodation with free WiFi. This apartment is 1.7 km from Poitiers University. The apartment is fitted with 2 bedrooms and a fully fitted kitchenette with a microwave. A TV is available. I.A.E Poitiers is 2.6 km from the apartment. The nearest airport is Poitiers-Biard Airport, 5 km from the property. Situated in Poitiers, 90 metres from Poitiers Town Hall, Apartment Grimaux.2 provides a living room with a TV. Guests staying at this apartment have access to free WiFi and a fully equipped kitchenette. The bathroom comes with a shower. Poitiers University is 1.7 km from the apartment. Poitiers-Biard Airport is 5 km from the property. Apartment Grimaux.5 is an accommodation set in Poitiers, 90 metres from Poitiers Town Hall and a 20-minute walk from Poitiers University. This apartment features accommodation with free WiFi. The apartment includes 1 bedroom and a living room with a TV. The bathroom features a shower. I.A.E Poitiers is 2.7 km from the apartment, while Soregies is 3.2 km away. The nearest airport is Poitiers-Biard Airport, 5 km from the property. Le1Bis offers accommodation in the centre of Poitiers, 300 metres from Poitiers University. The unit is 400 metres from I.A.E Poitiers. Free WiFi is available throughout the property. The kitchen features a dishwasher, an oven and a microwave, as well as a coffee machine. A TV is featured. There is a private bathroom with a bath or shower. Bed linen, towels and dish towels are provided by the property. Poitiers Town Hall is 500 metres from Le1Bis, while Infantry Regiment is 700 metres away. The nearest airport is Poitiers Airport, 2 km from Le1Bis. Hotel Ligugé Preferred hotel ! This entirely air-conditioned hotel is located next to a peaceful park. It offers free Wi-Fi, a heated outdoor swimming pool accessible from mid June until mid September. The property is easily accessible from the A10 and N10 roads. The Best Western Le Bois de la Marche provides free on-site parking and is a good base for visiting the area. It is just 15 minutes from Parc de Futuroscope, 3 km from Poitiers and close to a wildlife park. Guest rooms at the Best Western Le Bois de la Marche include a flat-screen TV, a CD player and a telephone. Buffet breakfast can be enjoyed every day at Le Bois de la Marche. The restaurant serves traditional French cuisine. During the summer season and depending on the weather, each Thursday and Friday evenings, afterworks including music, plancha and drinks are organised in the property's park. The Best Western also has a tennis court, a 24-hour bar and a sauna. Situated in Poitiers, 500 metres from Poitiers University, La Maison de la Liberté offers free WiFi and city views. Each unit is fitted with a microwave, toaster, a coffee machine, as well as a fridge and kettle. There is also a kitchenette in some of the units equipped with a stovetop. I.A.E Poitiers is 500 metres from the apartment, while Infantry Regiment is 1.1 km from the property. The nearest airport is Poitiers-Biard Airport, 4.3 km from the property. Providing views of the Notre-Dame la Grande bell tower, Les Appartements Notre Dame offers self-catering apartments in the centre of Poitiers. Guests can enjoy free Wi-Fi and some apartments feature a private balcony. Les Appartements Notre Dame are decorated in a contemporary style and feature a living area with a flat-screen TV with cable channels and a Blu-ray player. Shared laundry facilities are available in the building. Guests can prepare homemade meals in the fully equipped kitchen and enjoy them in the dining area. A variety of restaurants and bars can be found within a 5-minute walk. The Poitiers Train Station is a 15-minute walk away and Futuroscope is a 20-minute drive away. Guests can visit the Sainte-Croix Museum alongside the François Mitterrand Media Library just 500 metres away. Joli studio au coeur de Poitiers in Poitiers features accommodation with free WiFi, 500 metres from Poitiers University and 800 metres from Poitiers Town Hall. This apartment is 800 metres from I.A.E Poitiers. The apartment features 1 bedroom, a flat-screen TV with satellite channels and a fully equipped kitchen that provides guests with an oven and a microwave. The property also has 1 bathroom is equipped with a shower, while free toiletries and a hair dryer are also available. Infantry Regiment is 2 km from the apartment. The nearest airport is Poitiers-Biard Airport, 6 km from the property. Aparthotel Grand Rue offers accommodation in Poitiers, 1.1 km from Poitiers Town Hall and 1.5 km from I.A.E Poitiers. Guests may enjoy the free WiFi. This apartment is fitted with a living room and a fully equipped kitchen with an oven. A flat-screen TV is available. Poitiers University is 1.5 km from the apartment, while Soregies is 2.8 km away. The nearest airport is Poitiers-Biard Airport, 6 km from the property. Studio Tout Confort Centre Ville is situated in Poitiers, 1.3 km from I.A.E Poitiers, 1.3 km from Poitiers University, and 1.3 km from Poitiers Town Hall. This property is 2.6 km from Soregies. This apartment features a terrace, a living room and a flat-screen TV. There is a dining area and a kitchenette equipped with a microwave. Rocade Distribution is 2.7 km from the apartment, while Infantry Regiment is 2.9 km away. Poitiers-Biard Airport is 6 km from the property. Chambre des Moulins is situated in Poitiers, 600 metres from Poitiers University, and 10 km from Futuroscope Theme Park. Some rooms include a seating area to relax in after a busy day. All rooms are equipped with a private bathroom equipped with a shower. For your comfort, you will find free toiletries and a hairdryer. You will find a shared lounge at the property. An organic breakfast is served in the morning. The bed and breakfast also offers free use of bicycles. I.A.E Poitiers is 600 metres from Chambre des Moulins, while Poitiers Town Hall is 1.2 km away. The Class Hôtel is located in Poitiers, a 10-minute drive from the city centre and 1 kilometre from the A10 motorway. It offers accommodation with free Wi-Fi internet access. Each guest room at the Class-Hotel has a flat-screen TV and a private bathroom. A continental breakfast is served daily and restaurants can be found just 250 metres from the hotel. The Class provides free private parking and it is just 10 minutes from the Futuroscope theme park. A 10-minute drive from the Futuroscope amusement and business park and 800 metres from the A10 motorway, Hotel Come Inn offers you free WiFi access in the entire hotel. Rooms here will provide you with a flat-screen TV, a DVD player and satellite channels. Extras include a desk. Breakfast features hot and cold drinks, pastries, breads, brioches, pancakes, cereals, cold meats, cheese, eggs, yoghurt and fruit. The hotel's restaurant is open from Monday to Thursday only for diner. Hotel Come Inn is a 15-minute drive from the town centre of Poitiers. There is free on-site parking. Guest accommodation Béruges Preferred hotel ! Offering free WiFi and a terrace, Le Relais De La Briquetterie is situated in Béruges, 12 km from Poitiers. Chasseneuil-du-Poitou is 16 km from the property. Free private parking is available on site. Some units comes with a private bathroom with a shower. Basic double rooms share a bathroom. Guests can enjoy the on-site restaurant. Châtellerault is 38 km from Le Relais De La Briquetterie, while Parthenay is 34 km away. The nearest airport is Poitiers Airport, 9 km from Le Relais De La Briquetterie. With a 24-hour front desk, ibis Styles Poitiers Nord is a hotel with an outdoor swimming pool, located a 10-minute drive from the Futuroscope Theme Park and 5 minutes from the centre of Poitiers. The train station is 4.4 km away. The guest rooms are equipped with an LCD TV with Canal+ channels. Each room has a private bathroom with a walk-in shower and a hairdryer. Family rooms are available. Guests can browse the free WiFi throughout ibis Styles Poitiers Nord or enjoy a meal at the hotel's restaurant, le Patio. Free parking is available on site. ibis Styles Poitiers Nord is located just a 5-minute drive from exit 29 of the A10 Motorway. Mac Bed is located between Poitiers and the Futuroscope Centre, and provides low-cost accommodation in northern Poitou. Free Wi-Fi is available throughout the hotel. Each Mac Bed room is equipped with a TV with satellite channels, a fan and a private bathroom with a bathtub and shower. Guests are invited to relax with a drink in Mac’s bar or on the terrace. Mac Bed is conveniently situated near Exit 29 of the A10 motorway. It is a 5-minute drive from the Poitiers Biard Airport. Free parking is available for cars and motorbikes. Located in Poitiers, Brithotel Poitiers Restaurant Beaulieu is just 15 minutes away from Futuroscope Theme Park and 1.5 km from Poitiers Exhibition Centre. It has a 24-hour reception and a furnished terrace. Each guest room is equipped with a flat-screen TV with satellite channels and free internet connection. All rooms have a private bathroom with a hairdryer. Traditional French cuisine is served on week days in the restaurant at Brithotel Poitiers. Guests can enjoy a drink in the hotel bar. There is a commercial area next to the property and Chauvigny, with its medieval castle, is located 30 km from the hotel. Free private parking is available on site. The Barthotel is located 2.5 km from Poitiers city centre and 1 km from the University Campus, Milétrie Hospital and the Medicine Faculty. It offers rooms with a TV, a private bathroom and free Wi-Fi access. The Barthotel provides a ticket service for entry to nearby attractions and there is also a free on-site car park. Guests of the Barthotel can visit the medieval city of Poitiers with its Cathedral and the Notre-Dame la Grande. It is a 5-minute walk from a sports complex and 2 km from the Park des Expositions. Futuroscope is only a 15-minute drive away. The bus stop situated in front of the hotel allows direct access to the city centre and the train station is 20 minutes away by bus. Guest accommodation Migné-Auxances Preferred hotel ! Le Moulin De Nanteuil is a 15th-century renovated watermill offering accommodation in Migné-Auxances, 9 km from Poitiers.Free WiFi is provided and free private parking is available on site. Each room comes with a private bathroom equipped with a bath or a shower and a separate toilet. A flat-screen TV is provided in all room. Some units feature views of the river or garden. For your comfort, you will find free toiletries and a hairdryer. Breakfast is served in a room with a glass floor above the river, or on the terrace. There is a shared kitchen and dining area for 2 of the property's bedrooms. Guests have access to the garden and to 2 terraces, one of which is along the river. Poitiers is 6 km from Le Moulin De Nanteuil, while Chasseneuil-du-Poitou is 3.6 km from the property. The nearest airport is Poitiers Airport, 6 km from Le Moulin De Nanteuil. The ibis Beaulieu Poitiers is located 4 km from central Poitiers and 10 km from the Futuroscope Theme Park. The air-conditioned hotel offers free Wi-Fi internet access and an on-site bar. The soundproofed guest rooms at ibis Beaulieu Poitiers include a flat-screen TV with satellite channels. They each feature a telephone, a work desk and a private bathroom with a shower and a hairdryer. A buffet breakfast composed of sweet and savoury dishes such as eggs, fruit salad, yogurts and juices is served every day. Pastries baked on site and fresh French Madeleine cakes are also on offer, as well as a hot beverage and a piece of fruit to take away. Outside of regular breakfast hours guests can also enjoy a lighter option, available from 04:00. Free private parking is available on site and the Parc des Expositions is 1.3 km away. The property is 8 km from Poitiers - Biard Airport and 10 km from the A10 motorway. Featuring free WiFi, La Clef des Champs offers pet-friendly accommodation in Poitiers. This senior residence is 7 km from Chasseneuil-du-Poitou. Free private parking is available on site. There is also a kitchen, fitted with a microwave and toaster. Bed linen is provided. La Clef des Champs also includes a heated swimming pool. Guests can enjoy the on-site bar and restaurant. The property also offers special diet menus. La Roche-Posay is 39 km from La Clef des Champs, while Châtellerault is 26 km from the property. Set in a 35-hectare park with centuries-old trees, this 16-century castle is a 5 minute drive from the city centre of Vouillé. It offers an outdoor pool and a fully furnished terrace. Each suites and apartments at the Château de Périgny features high ceilings and traditional decor with ancient furniture. They are equipped with a seating area, satellite TV and a private bathroom. Some rooms feature a terrace. The restaurant serves traditional French cuisine in the large classic dining room. A buffet breakfast is served daily. Château de Périgny offers a garden with a playground for children’s entertainment and a tennis court. Free Wi-Fi access is available in public areas and some rooms. Free private parking is provided. It is 15km from Poitiers and 20km from Futuroscope Park. Below here is the hotels map of Vouneuil-sous-Biard. Names and details of Vouneuil-sous-Biard hotels can be shown on the map clicking on the prices icons.